How's the volume control wired up? Just curious what the 100uF cap does in this layout? I had breadboarded this awhile back using the homewrecker site (http://www.home-wrecker.com/bazz.html) and it sounded pretty sweet, but that layout does not include the 100uF cap. Also, has anyone tried putting a gain control in this? Anyway. Works and sounds really mean. Tag it. Cool cheers matey. I changed the layout slightly because putting the 9V row on the bottom meant I could add a filter cap more easily and also save a column. Everything else is the same though. sounded better with 2n5089 but I didn't get to much sustain. Try MPSA18. Those have higher gain range, and aren't as prone to premature gating as 2N5089s are. thanks, I'll grab a couple of MPSA18 anytime. do you know any simple and vintage clean octave circuit besides Green Ringer? Haven't come across one. The Clean Octave Blend is not very clean, not even as clean as Green Ringer. I've built Sabro's OC-2 layout, but wouldn't call that exactly simple. Nor vintage :) And it's one and two octaves down. If yoo find one, let us know. I might like to get one like that too. alright, thanks a lot! I'll let you know if I find something out. While this is a nasty fuzz, I didn't get any octave. I did get a super compressed snarling speaker punisher, though. Haven't built this, but try the neck pickup and play above the 8th fret or so. That usually "helps" with my Green Ringer. Yea, I tried that, but nothing. What's funny is the Hyperion I built from Marks' layout does octave above the 12th fret. So maybe I made a mistake(multiple ones) on both pedals! I built this circuit into a spam can and it's pretty awesome. I'm getting pretty much the same sound as the clips on the site. There's not a lot of octave on single notes but it has some nasty octavey overtones on chords. What is the easiest way to add a switch so you can switch between buzz box and bazz fuss? I'm looking for an octave up fuzz and this appeals to my lazy side. Looking at the comments the octave isn't very pronounced, would there be a way to increase that if mine turns out that way? I wouldn't really expect so mate, it's a pretty simple circuit and the octave is probably an artifact of two high gain circuits in series and I expect the strength of the effect may be more luck than judgement. I will be doing a layout for the Mid-Fi Peace Gun later though if that interests you? It's a fairly simple 2 transistor circuit too. Yikes! I've got a burning smell as soon as I engage the pedal. Am I right in thinking a bad electrolytic would be the most likely culprit? Nope, the first 2N3904 is burning hot. Ouch. Just realized my "9V" adapter is reading at 15V. That adapter is going in the garbage. I've seen a few instances like that. I'm pretty sure you have a short on your board, probably just a tiny solder bridge between strips. That'll burn your supply in a second. I've burned a few myself - and afterwards i stopped using ac/dc adapters completely on my desk. Solder a battery snap to 2,1mm dc plug and use that to test your circuits. If you'll burn a battery, you'll only lose that instead of a supply. Thanks miro, it's a bit like chicken-or-the-egg right now... I'm not sure of the board fried the adapter or if the adapter was always running at 15v and therefore fried the board... Either way I think you're right, I'll be testing with batteries from now on. 15V won't fry your board :) But even the tiniest solder bridge can burn out the regulator inside the supply, resulting the supply giving out 15V of completely unregulated voltage. Also the heating transistor suggests that there is a short. Hey, swapped the input cap for 33u, and the other 10u caps for 22u; I'm trying to get as close as possible to this Scumtone FX green fuzz fuzz for both my bassist and myself, after we kinda tore a trace off the pcb of the original... trying to re-make it with some mods that we had done ourselves; also, what does that 100u do? on the scumtone board, it has a 10n that doesn't reflect this layout. I should note that the scumtone is a clone of this, but with 15u tant capacitors ( we changed the input out for 3 10u's in parallel to make it more bass friendly), also swapped the germanium diode for 2 4148's in parallel. Note, all these mods worked on the original board, and it sounded great; just what we were going for. Trying to recreate it based on this layout... not working. It's oscillating when not plugged in, w control with the pot. I checked for anything funky with the board, no jumped traces, and no wires in the wrong place. Do you think it could be the capacitors? built it and it works well but I get a fair amount of oscillating "fizz" noise when not playing, any ideas on how could I avoid it? 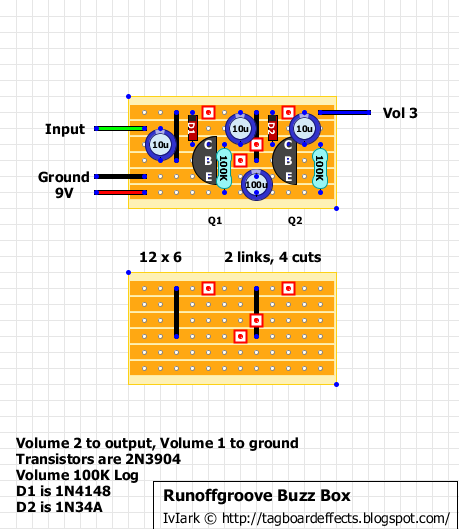 I am a beginner, and I like to try this circuit. Is it possible to add a toggle on/on/on to switch between one of the Bazz circuit or both? Can anyone tell me how to wire a dpdt foot switch to this circuit? I can't find any info on that at all.